Remember when we had to reduce CO2 emissions to zero to save the planet? NCAR says – Never mind. | Watts Up With That? Remember when we had to reduce CO2 emissions to zero to save the planet? NCAR says – Never mind. From the NATIONAL CENTER FOR ATMOSPHERIC RESEARCH (home of Dr. Kenneth Trenbert) and the “backpedaling on climate, it’s a travesty” department comes this story that sure looks like they realize climate sensitivity is lower than originally thought. Or, maybe it’s because they finally realize they can’t preach for low emissions when their own coal-power-driven supercomputing center in Wyoming has a massive carbon-footprint. 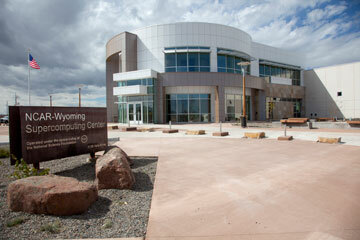 The building housing the NCAR-Wyoming Supercomputing Center in Cheyenne, Wyoming, was completed in the summer of 2011. (©UCAR. Photo by Carlye Calvin. BOULDER, Colo. — As society faces the challenge of limiting warming to no more than 2 degrees Celsius, new research finds an apparent contradiction: Achieving that goal doesn’t necessarily require cutting greenhouse gas emissions to zero, as called for in the Paris Agreement. But under certain conditions, even zero emissions might not be enough. The team generated 10 different scenarios. They found that Earth’s warming could be stabilized at 1.5 or 2 degrees C — without overshooting the goal — by drastically cutting emissions in the short term. For example, total greenhouse gas emissions would need to be slashed by about 80 percent by 2033 to hit the 1.5-degree target or by about two-thirds by 2060 to meet the 2-degree target. In both these cases, emissions could then flatten out without ever falling to zero. The Paris Agreement stipulates that global warming be stabilized at well below 2 °C above pre-industrial levels, with aims to further constrain this warming to 1.5 °C. However, it also calls for reducing net anthropogenic greenhouse gas (GHG) emissions to zero during the second half of this century. Here, we use a reduced-form integrated assessment model to examine the consistency between temperature- and emission-based targets. We find that net zero GHG emissions are not necessarily required to remain below 1.5 °C or 2 °C, assuming either target can be achieved without overshoot. With overshoot, however, the emissions goal is consistent with the temperature targets, and substantial negative emissions are associated with reducing warming after it peaks. Temperature targets are put at risk by late achievement of emissions goals and the use of some GHG emission metrics. Refinement of Paris Agreement emissions goals should include a focus on net zero CO2—not GHG—emissions, achieved early in the second half of the century. That’s pretty inetesting, since the model-derived temperature forcasts are all over the map. Was their simplifierd model an “average” of these wildly divergent models? If so, that should do it. No problem. I’ll buy into it, since averaging magically erases all uncertainties. A brand new application for the Law of Large Numbers. It’s getting to be almost as versatile as CO2. There’s the problem. There is NO physical connection between non-existent “greenhouse gases” and global mean temperature. These gases are more properly called “radiative gases” and have no effect in sunlight, being saturated and converting IR to heat and heat to IR with zero effect. It is at night that CO2 and water vapor unilaterally convert heat to IR, which is then lost to space. This is why the air chills down so rapidly after sunset. The models have no night-time and thus completely ignore this real effect. If anything they serve as a negative feedback mechanism. That’s something the warmest scientists (using “scientists” loosely here) will never admit. Just even comtemplating reducing emissions back to the early 1800s is insane, but going back to the Stone Age and wasting what energy we have on sequestering CO2 is suicidal. The Paris Treaty is the most tragically evil Treaty ever promulgated on mankind. Is that accurate? I’ve surmised that it must be true. If you’re confirming it, I’m saddened at the state of ‘Climate Science’. The atmosphere behaves differently between day and night, is this a surprise? They are all making the same assumptions – the effect of so-called greenhouse gasses, with CO2 being the main controlling gas. There is no testable experiment involving the real atmosphere that can be run. That CO2 is the gas of life since plants require it, the models are meaningless. There is no testable experiment involving the real atmosphere that can be run. For co2 to be a problem, it has to accumulate energy into the system. You can look at what controls cooling, which is regulated by water vapor, and you can look at the bi annual seasonal change with a known change of insolation to see the effectivity of a Watt of input power (<0.02F/whr/m^2). All of these show it does not accumulate energy. Follow my name if you want to read more. >>> True. The non-existent gases don’t have much of an impact. Nor does their sister-group, the somewhat-less-than-ideal gases. “These gases are more properly called “radiative gases” and have no effect in sunlight, being saturated and converting IR to heat and heat to IR with zero effect. >>>This is not a “zero effect”, this is essential to the structure and function of our atmosphere. Heat matters. CO2 absorbs IR, it is turned into heat: the molecules “vibrate” and pass the energy on to O2 and N2 – this is why CO2 has such an impact even at a low proportion of the atmosphere. No one ever talks about this, and I didn’t understand it myself until I asked my uncle, who is an atmospheric physicist at NOAA (in aerosols). (I’m a layman in physics, and this is simplified, but maybe it will fill in a gap as it did for me) So we have a huge band of heat from the sun stored in our atmosphere, radiating outward, yes, but also inward. It chills down rapidly because the direct radiation of the sun is gone. Imagine if all the heat of the Earth were heading toward the Antarctic during their winter (permanent night, heat escaping to atmosphere), while the sun was pounding on the other end, what kind of weather that would make. That’s the kind of scenario you are talking about, but on the global scale. The atmosphere not only keeps heat in, it acts as a shield from the sun’s intensity, smooths out daily variation by storing energy. >>>I don’t think this would be appropriate. The effect is predictable, short term, and doesn’t affect long-term averages. It’s more important to include day length in the model, which captures better the changes in energy over time. There is a huge band of energy in the atm, but it’s not Co2, it’s water vapor. Co2 impacts cooling at sunset, I regularly see 3 or 4F/hr at sunset, this too is impacted by absolute humidity, as deserts cool faster, tropics slower at the surface. But that’s only part of the story, once air temps near dew point, water vapor stops it from cooling(by releasing the heat of evaporation supplementing surface energy as it’s bled off to space through the optical window), if there’s enough of it. See deserts and tropics. What this is in effect is a nonlinear regulator, where Tmin is controlled by dew point, not co2, and as such co2 has no real ability accumulate energy. 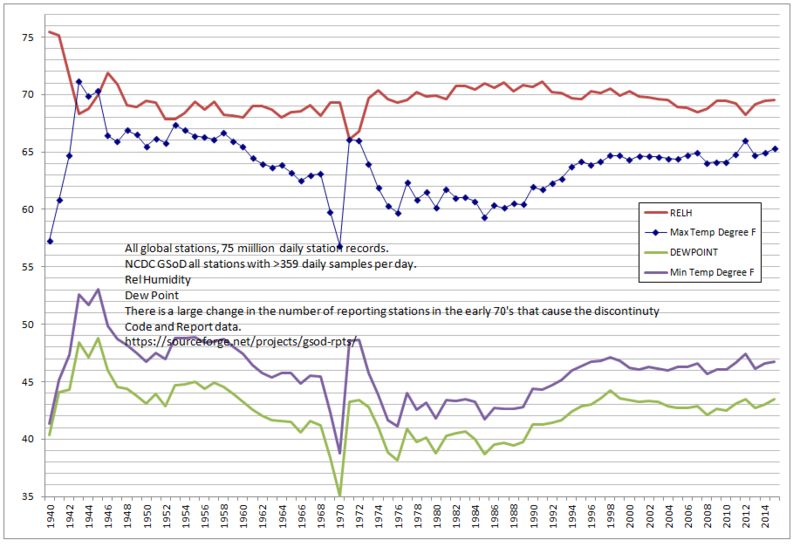 You can see this in the over night data, as well as the biannual changing seasonal temp changes. This simple chart explains everything, if you can understand it. This one shows that it’s dew points that set daily min temps worldwide, 97% correlation between dew point and Tmin, about 96% between dew point and Tmax. Dew points follow warm surface waters as they move around in the oceans as the ocean cycles play out. The arctic melts from below, and open water cools the planet. Pretty simple self emergent regulating systems, all because of the energy in the state changes of water and radiative physics. We truly live on a water world. That supercomputer might be just dandy for real world applications, such as military applications and NASA space space applications. I have read this 3 times now and it still makes no sense. It seems like they are saying that if temperatures don’t go up then we don’t have to cut emissions to zero. But if we cut emissions to zero, temperatures might still go up. I guess if it were easy, anyone could do it…oh, wait. It’s not just you. That was the part I re-read several times. Maybe it was lost in translation? I can’t make sense of it either. I thought it was just me. It is easy. Since there is no correlation between emissions and temperature or even atmospheric concentration of CO2 it doesn’t matter how fast we change emissions the temperature will vary naturally and it controls the atmospheric content. If the temperature quits warming we won’t have to cut emissions. If the temperature keeps warming cutting emissions will to zero will not fix the temperature. I think they have their statement correct but don’t know why. I don’t understand your problem. They quite clearly say that if CO2 emissions are drawn down fast enough, they don’t have to go zero emissions to meet the target temperature, but if you draw the emissions down to slowly, even going to zero won’t hit the temperature target. In other words, if we punish ourselves hard enough early, we can stop punishing ourselves sooner and meet the target temperature. Sort of like turning the thumbscrews tight enough, soon enough brings the big burst of pain, but you get used to, and they can stop tightening the thumbscrews. Of course the pain never goes away, but at least it doesn’t keep getting worse. Going by the headline, you would think this was refuting Paris but instead they are trying to put different makeup on that pig. I agree with Tom in how he reads the statement. It doesn’t make the statement right, but it isn’t that hard to understand. Agreed, the meaning is clear, but wrong. This means that Anthony Watts’ headline seriously misrepresents what the article says. What they are saying is that it’s the final CO2 concentration in the atmosphere that matters, so we if drop emissions rates quickly, it would save us from more severe cuts later. Think about budgeting. If you drop your spending while you still have a reserve, you don’t have to cut back nearly as much as if you let your bank account drop to zero. If you are only looking at the spending and not the totals, you only get half the picture. On the other hand, the fact that they can’t explain such a blindingly obvious (to the point of being inane) statement does not speak well for them. It’s time to start the budget doomsday clock for bad public policy advice. Ethics classes became mandatory in U.S. business schools years ago. It’s time to do the same now with climate science and environmental programs. Perhaps the time to zero out climate change research $ is long overdue. Its all a bunch of garbage. They cant model clouds in any meaningful way. Pat Frank proved in a paper (which is still trying to get published) that the uncertainty in cloud error propagates in each iteration so that the total error becomes so large as to make any climate model worthless. Why reputable scientists woould put any faith in GCMs is beyond me. Any climate study that uses a model for any of its projections is worthless. Modeling is the new religion. Pat Frank has been rejected by 7 or 8 journals, maybe he is wrong? It isn’t the function of peer review or journal editors to figure out if something is wrong, but is it novel, worthy of discussion, and free of gross errors? A bland “Doesn’t cover new ground” excuse is just barely an excuse. Well, actually it’s not an excuse at all, just a bad fig leaf. Maybe. But maybe his conclusion is just politically incorrect while being scientifically correct. What is important is whether the reasons for rejection are valid, NOT just that it has been rejected. When there is a prevailing paradigm in science, one expects the majority of scientists to get behind it. That is why it is a paradigm! However, that doesn’t make the paradigm valid, as many historical paradigm shifts have demonstrated. >>>Maybe suggesting it will make it seem more likely. What is “politically incorrect” in science? “Maybe” his research is swayed by political concerns. Perhaps that is the stumbling block? “Maybe” it is focused on evidence that supposedly refutes mainstream science, but doesn’t really.” I don’t have any idea, but this is a good way to spread rumors…and your own paradigm. >>>By the time it’s a “prevailing paradigm,” scientists would already be behind it. That happens when paradigms are correct: more and more people research it and see the evidence for it. Scientists in peripheral fields see the evidence and are convinced. And then there are many by this time who truly do take it on faith because they have trust in the consensus and no reason to doubt it. The contrarian scientists don’t have an alternative explanation for the evidence that stands up to scrutiny. Offering the same old criticisms that they did 20 years ago suggests they have nothing constructive to say. It’s destructive. >>> How many paradigms have gathered more and more evidence, convincing a wider and wider body of scientists throughout the world over the course of 50 years of extensive research…and then “shifted”? >>>Exactly. Humility! The lesson is, leave the science to those who have the expertise. Even bright, well-educated individuals have limits to their knowledge and experience. Scientists better than anyone ought to know how much value there is in expertise. We have different perspectives on the world, and it colors the way we see modeling and climate change. I know mine does, and I’m starting to understand that better. Paradigms based on demonstrably faulty IPCC climate models and agenda-driven science as evidenced by Climategate and numerous scientist/activist crusades, all used to fundamentally alter our society, economy and energy systems. Go peddle your sophistry elsewhere, Kristi. You said, ““Maybe” his research is swayed by political concerns.” The point is that Langlee was speculating and I was providing an alternative speculation. Mine was no better than Langlee’s because there is no good evidence to support either. I said, ““When there is a prevailing paradigm in science, one expects the majority of scientists to get behind it….” You then supported my statement with, “… more and more people research it and see the evidence for it. Scientists in peripheral fields see the evidence and are convinced. And then there are many by this time who truly do take it on faith because they have trust in the consensus and no reason to doubt it.” However, that can and HAS happened when the paradigm was wrong. Thank you for acknowledging the wisdom of my statement. You naively asked, “How many paradigms have gathered more and more evidence, convincing a wider and wider body of scientists throughout the world over the course of 50 years of extensive research…and then “shifted”?” The answer is virtually all abandoned paradigms, such as phlogiston, ether, Newtonian physics, geosynclines, stationary continental platforms, etc. I could go on, but it might be instructive for you to do the exercise to broaden your knowledge about the history of science. You suggested, “The lesson is, leave the science to those who have the expertise.” You are implying that only specialists can make contributions to science. Even (maybe even especially) experts are not infallible! It doesn’t take a doctorate in ichthyology to know when a dead fish stinks. Until the last 50 years, most contributions to Natural Science were from generalists who dabbled in many disciplines. Even the incomparable Newton explored alchemy. Sometimes a breakthrough occurs because one is not indoctrinated in the ‘Truth’ and looks at a problem with an open mind, unfettered by what he is supposed to believe. That is what publishing is supposed to accomplish — providing others (even outside the specialty) the opportunity to critique the data and claims of the ‘expert.’ One of the weak points of the post-war specialization of scientists is that they often make stupid mistakes because their knowledge-base is so narrow and they don’t realize their claims are disproven by what is known in other disciplines. Please tell us how many research papers actually investigate the operation of the atmosphere and how many just assume that the relation between CO2 and temperature has already been proven? Remember, using a model as the basis for your research proves nothing about the real world unless you assume the model you are using is accurate and applicable to your research. Be careful with assumptions. Look up the old saying about assume and what they do to you. What we are seeing is way too many studies/papers relying on unproven and inaccurate models with no investigation into whether the model is both applicable and correct. A lot of scientists are building an upside down pyramid of knowledge. However, if the bottom collapses, so does all the subsequent scientific knowledge and reputations built on top of it. Only time will really tell what the truth is. But there will be quite a gnashing of teeth if temperatures continue to pause or even cool with more CO2 in the atmosphere. Well, that’s a good time to segue into reminding people of the myriad ways Phil Jones and Michael Mann (et. al.) sought to thwart publication of papers they didn’t want to see during the IPCC assessments, which quickly evolved into seeking which authors of papers they didn’t want to see, which evolved into which journals and journal editors they did not want to see. Read all about it here: John Costella summarizes these aspects of the ClimateGate conspiracy so beautifully. Or read the raw e-mails in more full featured manner at Tom Nelson’s site. If you have never read any detailed analysis of ClimateGate, I urge you to read the first of the two links in my preceding post. It will be well worth your time. You will see incredible, almost unbelievable, tendentious (ie. working backwards from a foregone conclusion) rent-seeking, unaccountable, CYA behavior, masquerading as open and honest scientific inquiry. The bad actors dominate climate change study in the IPCC, in the USA, in the UK at the Met and EAU-CRU, in Australia, in the people who run RealClimate.org (some of which also run the Wikipedia monopoly on climate change information there). Taxpayer funded employees of the US citizens are rampant in those e-mails, representing NASA, NCAR, NOAA,and more. Public sector paid academics, and professional groups like the AGU and the Royal Society, are also found behaving badly, and in their own words. Know what you’re dealing with as a skeptic. Read and understand the full meaning of ClimateGate. Well, don’t the true believers in the Climate Catasclysmicity sect, scientist or not, have to put faith in GCMs since without GCMs they have nothing upon which to base their apocalyptic claims of impending doom for humanity? It seems obvious. Planet Earth is an assassin and mankind will get got sooner or later regardless. Just hang on to what you got and don’t let go. The fact that tolls like ‘Kristi’ support the ‘redefinition of peer review’ speaks volumes. Pathetic, also disgusting, snowflakery. Just like trying to tell us that forest models (and I’ve done those) prove the utility of CMIPs. Navier-Stokes is currently unsolvable and also irrelevant in respect to our atmosphere. But the boring boring will no doubt continue, thinking it knows something special. Poor critter. Interestingly the same group of researchers have determined that if you run your automobile in reverse it will such CO2 out of the air into your fuel tank. That was the result from running their model in reverse, but hey!, a model is exactly the same as reality right? Also, they’re not sure which way was up at the beginning anyway. So yeah. Like a western country song played backward. You get back your dog, your truck, and your girl. “the scientists also looked at scenarios in which the temperature was allowed to temporarily overshoot the targets,”… it’s as if they think it’s like controlling a thermostat. The arrogance of these people. If they have a pair of brain cells among the whole lot they better be back peddling, It doesn’t take a rocket scientist to see CS to a doubling is at or below the planck response via a number of different methods. And likely a lot lower. 🙂 I so want to work building rockets, or energy sources for spaceships! Very jealous! And he has more than a pair of brain cells. I almost got to be a rocket scientist. Unfortunately the req was cancelled before the background check could be finished. The models are so reliable and accurate that one can make policy recommendations based entirely on them. And pigs can fly. Unfortunately they are making policies based upon their models, and the policies are flying about as well as their pigs. I remember a quote, attributed to Werner von Braun, that with enough power he could fly a brick. I think that there is a parallel with alarmists attempting to garner political power to ‘fly’ their political ideologies. Clyde, just to be clear, what political ideologies are the alarmists are promoting? I would say that the alarmists are demonstrating a lack of faith in Capitalism and demanding that government(s) impose penalties and restrictions regarding the use of fossil fuels. The recent case of SF/Oakland suing oil companies demonstrates the essence of the problem. Instead of solving the supposed problem through conservation, investment in alternative technologies, and improved public transit, they are suing the companies that are producing what consumers want. That is, cheap, high-density energy. The cities should be leading by example, not using the courts to force a solution that few people want. The oil companies are not literally forcing people to use the products, such as with addictive nicotine added to cigarettes. They can use solar to heat their water and homes. People are free to walk or ride bicycles if they so choose. It isn’t the case that the oil companies have bought out the bicycle companies. There is also an attitude amongst ‘Greens’ that Nature is more important than the welfare and standard of living of people. To that end, they expect people to make sacrifices that are forced on them by government instead of allowing people to make choices freely. Many bloggers on this board, which I’m sure that you are aware of, use stronger words such as “socialists.” The alarmists promote utopian societies, as THEY see it in their mind’s eye. That is, they want to force people to do what is in their best interest, instead of allowing them to decide it individually. Clyde, it’s even worse than simply anticapital. The goal of the EU/UN and the recent Democrat (and establishment Republican) elites want global governance. I say this aware of how nutty this might sound to a lot of nice folk like Kristi. Look at the cast of characters who created and peopled UNFCCC, IPCC, Kyoto Protocol, even the Stockholm Conference 50 years ago. Google the quotes of Maurice Strong (a Canadian communist, highschool drop out genius billionaire who took up residence in Beijing and died there at 85 or so) who created all these bureaucracies and the efforts of Soros, and other billionaire elites. Not a scientist among these globalists. Moreover, globalization of the economy worked because the main thrust of corporations is to maximize returns. Strong and other elites manipulated this core goal facilitating even greater returns to get corporatist as supporters. They, through American elitist politicians, moved American enterprise and jobs out of the country to China to bring down the American economy which was too attractive a model and an impediment to such plans. Pay for Play of the Clintons was part of the reward system. Soros’s foundation purpose is to get rid of national boundaries (nobody accomplished this better than Democrats and elite Republicans who let the borders go). The scientists seem unaware of all this and they probably are in the main. They have, however, been unwittingly bought with copious research funding, exotic trips, rockstar fame and, where necessary, intimidation re careers.. to provide answers that can be used by these non scientist puppeteers. The small cadre of main warming scientists, the stars of Climategate, have manipulated peer review and other things to protect the status quo. The rest are going along to get along. Those who didn’t are well known outcasts whose careers were ended. Kristi suspend belief and educate yourself on the unsavory underpinnings and how it all got started. Thank you for supplementing my response. I didn’t put more time and detail into my response because of the short half-life of WUWT comments, and I don’t think that Kristi can be convinced to give up his dogma. But, you are right in that it really isn’t about science, it is about political power. Pigs can fly. Especially if you send them via Fedex or some other air carrier. I have a heart valve I got last November from a pig and I will be flying to Seattle in a couple weeks. I hope they won’t deny me a boarding pass on account of being a post trans pig. On account of the new PC standards, you now have to specify pigs fly under their own power, without assistance. If you do, you will be labeled piggist. It is demeaning to us to say pigs can’t fly. It is hate speech. You should be ashamed. PS. The personal pronouns for a post trans pig are `ig’ (he/she), ‘zig’ (him/her), and ‘zigs’ (his/hers). These come prefabricated with gender neutrality. Is saying ‘piggish’ hate speech? A micro/macro aggression? Do you require a safe place, Jeff? RE:”I will be flying to Seattle in a couple weeks. I hope they won’t deny me a boarding pass on account of being a post trans pig”. You and your porcine heart valve are ‘safe’, Jeff! Seattle wouldn’t refuse surgical and/or chemical alteration of any sort to a human. Even more generally, nearly all forms of mental illness, self-inflicted mutilation, and self-destructive behaviors are celebrated in Seattle. To the contrary, it is rational conservatives and/or climate skeptics that are discriminated against and threatened with institutionalized re-education, to ‘fix’ their persistent observations of and testament to verifiable facts. How do you measure negative CO2 emissions? Sure plants absorb CO2, but whose CO2 are they absorbing? It is due to the special nature of American CO2 we can assure the world that all American CO2 is being absorbed, but that the rest of the world’s CO2 is causing a real problem, especially the CO2 from the southern hemisphere as it swirls the wrong way. At some point the language itself becomes the barrier to understanding. And in this case their grasp of the English language is insufficient to convey their thoughts. Yes, they haven’t explained themselves very well at all. The entire document is full of confused thoughts. I would not bet your farm on warming. The cult of CAGW have gone all out in pushing their super amplification climate models to amplify the calculated (so called one-dimensional, no feedbacks, fixed lapse rate) estimate warming of 1.2 C for a doubling of atmospheric CO2. The 1.2C warming ‘calculation’ ignored the fact that planetary temperature does not even correlate with atmospheric CO2 levels for the last 420 million years. A lack of correlation, ‘Temp Vs CO2 levels’, for the last 420 million years is a paradox, indicates there is something fundamentally incorrect, in the atmospheric assumptions for the surface warming VS CO2 level calculation. During the cyclic Dansgaard-Oeschger and/or Heinrich cooling events there was abrupt cooling of large regions of the oceans. Atmospheric CO2 concentration is correlated weakly but negatively with linearly-detrended T proxies over the last 425 million years. Of 68 correlation coefficients (half non-parametric) between CO2 and T proxies encompassing all known major Phanerozoic climate transitions, 77.9% are non-discernible (p > 0.05) and 60.0% of discernible correlations are negative. … The correlation between DRFCO2 and linearly-detrended T across the Phanerozoic Eon is positive and discernible, but only 2.6% of variance in T is attributable to variance in DRFCO2…. …This study demonstrates that changes in atmospheric CO2 concentration did not cause temperature change in the ancient climate. This means the computers are increasingly able to deliver artificial stupidity. A.S.
Huh. Prognostications based on the Runes and Planets are not stupid enough. We need computers to prognosticate using AS to get the wrong answer in much less time, but at higher cost. Phew! I was worried there wasn’t a future for the silicon set. Intel loves modellers! When people say that CAGW is based on stupidity, assure them that it has been tracked down to Artificial Stupidity and that they have nothing to fear from it in the real world. No, computers deliver artificial intelligence. However, artificial intelligence is no match for natural stupidity. Kristi, do you get this? I still say we need to launch trees into space. Just to be safe! Huey and Dewey tending trees for eternity…..
Man, I loved that movie when I was a kid. I always cried. Darn lovable robots. It was my Old Yeller or Where the Red Fern Grows. I really don’t understand how they can shamelessly continue to publish papers that consist purely of numbers inputted into an existing climate model, a model that has failed to accurately predict climate thus far. It’s pretty disgusting how they call themselves scientists. A monkey can do what they do. Either way, this would spell massive starvations and population reductions. Maybe this is the real agenda? It’s net emissions. Plants absorb a lot, so does the ocean. Zero emissions doesn’t mean no fossil fuels at all. There are many ways to cut down, though, beyond switching to renewables. Conserving our oil and gas reserves isn’t a terrible idea, anyway, for security reasons. I was wondering the same thing, Roger. – How do we heat and cool our buildings and homes? – How do we get to work? Oooops, many folks don’t need to drive to work any longer to get their checks. – How do the farmers grow the “organic” stuff? And how does it get to our market? – How do we feed the horses that carry our garbage to the land fill? – Who cleans up all the horse poop? – Can the windmills provide the charges for our electric planes? – How can the 97% get to the next vacation for the IPCC or climate conferrence unless by sailboat? I wish there was a way to transport all these “scientists” and their acolytes to some planet with identical environment and ecology as Earth, but that has no infrastructure that has depended upon fossil fuels for over 160 years. Think mid-18th century, and the Declaration of Independence was a glint in the eyes of a few heretics that resented rule of the King. We need to build a C Ark as well. Launch C into space ASAP, the B can be delayed until all the telephones are properly sanitised. Then the A Ark (managers) can follow up soon after. And that is how you get to ‘negative CO2 emissions’! Mass population reductions means millions and millions of people are not exhaling CO2 or combusting anything to result in CO2 production any longer. Any way you account it, it surely is a ‘negative’ for all who pointlessly died to ‘save the Planet’. Show me that the climate sensitivity of CO2 is anything other than zero (on any climate dimension including “warming”), and I will start to listen. One data series after another is unable to show anything. Models are not science. If there is no supporting data, there is nothing to talk about and no national or international policy regarding CO2 emissions, increasing them or decreasing them, makes any sense whatsoever. Agreed. Still no empirical evidence that CO2 level changes do ANYTHING to temperature. And plenty of empirical evidence that suggests CO2 levels do NOTHING to temperature. Only by ignoring information that they don’t like do they arrive at their unsupported conclusions. So let’s see; these “scientists” take a bunch of crap, and run it through their crap-based models, then take a different bunch of crap, and do the same thing, then rinse, repeat, and – presto, they come out with with what they call “food”! Funny thing is, it stinks to high heaven. Bruce, you described the process very well. That the models never pan out should tell them that there is a problem with the models – CO2 is not the driver of climate. Planet Earth is in the sweet-spot orbit that allows us to live. Venus is a furnace and Mars is forever too small, cold and dry to be a viable alternative even with a significant amount of buried ice. The authors studied nothing. They committed mathematical onanism. Too much of that can cause blindness and insanity. What are the rewards for bad prediction and bad policy advice? Obviously another grant, and a couple more years to think up what you want to say for the next grant. The whole project is a crock. They cannot measure the results no matter what they are. They will have to MODEL the assumed results. It is called make work project. So, let me get this straight — results of a computer model are leading somebody to rethink policy goals based on computer models. Is it just me, or is this funny ? Robert, the policy goals were based on a phony climate model fed into an insane econometric model. … and now ANOTHER model is being used to assess the failures of the first models. Ouroboros: The Snake that Eats It’s Own Tail! Remember when there was institutional accountability? This 80% reduction that keeps getting talked about. Emissions have grown since then, and are still growing. At this point, shouldn’t they be calling it a 90% reduction? A lot of assumptions going on here with this ‘report’. Their first mistake is thinking that they can just dial back the climate anytime they think with reductions in CO2, whether sooner or later and get any result they want whenever they want, even reverse warming. With no consideration for Natural Variation, or even trying to truthfully understand what causes climate dynamics to begin with, with both natural and human induced processes at work. And which controls the other now, as the IPPC now states with 95% confidence that humans now control the weather, and therefore the long term climate. How did climate politics get this perverted and deliberately manufactured and distorted? Obviously, they think the ‘science is settled’. That should be the first clue. Sad. Yes. Not only are they apparently going evade a heat catastrophe but they are actually claiming to “stabilize” a climate which, by some measures, has never been stable in the history of the planet. Some days I would like to know what their definition of stable climate is, how often it occurs, and when was the last time it happened. To neurotic schizophrenics, they are normal and stable. Same applies to the climate, and climate alarmists, don’t you think? I still wonder if the writer that penned that line is a climate skeptic, and was finding a way to get his dig in on the Q.T. Yes, indeed, how did it? To the point where you can interpret a whole study without having read it? And to the point where you can get the whole thing wrong with such confidence? You don’t have any idea why the researchers did what they did, and it really doesn’t matter to you. Bosh! Humans don’t control the weather or the climate, and nowhere does the IPCC say so! I guess it depends what camp you are in Kristi. I happen to think that for the better part of the last 2.5 million years, especially during Earth’s full blown glacial conditions which is the majority of the time, that the good Earth is CO2 deficient, deprived, and the cause of extinction most recently of 47 species of Megafauna animals as CO2 levels dropped to 180 ppmv. That is is near plant life extinction levels! I am not a believer that CO2 is a dangerous pollutant that will cause disastrous warming to the planet. There is much to be fixed and corrected on the Earth, but reducing absolute CO2 levels is not one of them. When IPPC claims that humans are the main cause of warming, that implies that we now are in control, for better or worse, of the atmosphere, i.e. weather. My claim is no different than their claim. Anthony. I don’t know or get uncertain about your agenda. Is it right to give so much space and commentator efforts to a paper like this. Building a model on a model which is based on the wrong assumption assumptions says it all. The comments of A Tomalty and W. Astley were instructive, Many others place the paper being addressed where it belongs. Reading WUWT is a question of allocating time short in demand for an evry day hard working family man like me. Model insanity like that described here should better be placed in what I perhaps might wish – a foot note section called something like just model insanity. However, WUWT is repeatedly dealing with the ethics and and objective truth of science, and for the sake of my children I try to hang on and further the sound arguments of reality and how to measure and interpret it. Thus be as critical as possible with the subject treated and don’t ever think volume regarding WUWT. Plants are like “Paco Loco” . They do the same all the time. Harvest nutrients and CO2 and other building materials until there is no more around. The skilled farmer knows he has to replenish. Conveying that argument is one of they key ones in present day “real and honest science”. Do you mean Kevin Trenberth? Mods: typo? First sentence, first paragraph. Is it “Trenbert”? or “Trenberth”. His email address starts with “trenbert@…” but surname is “Trenberth”? Their target is bogus, as is the ream of stapled country papers called the Paris Agreement. They could read about the Texas Sharpshooter, then adjust the target accordingly. In order to get to zero emissions by 2100, we would have to reduce current emissions by about 1.22% per year, according to a linear trend, and the “scientists” also believe that would result in a 2-degree temperature rise by 2043, or 25 years from now, or an average rise rate of 0.08 C per year. Why do these “scientists” think that reducing emissions will result in an average rise rate of 0.08 C per year, when since the 1975 low point (after a period of falling temperatures), temperatures have risen by less than 0.03 C per year on average, during a period of rising CO2 emissions? What would cause such an acceleration (more than doubling) in the temperature rise rate? So, if CO2 emissions are not reduced from their present levels, and temperatures actually rise less than 2 C by 2043, will these scientists admit they were wrong about their predictions? After all, past models have over-estimated the temperature rise observed so far! By the way, how do the scientists propose to get to zero emissions? Build nuclear power plants everywhere, and use plug-in electric cars? But if someone in the year 2100 is shivering in a nor’easter and throws another log on their fire, that’s still emitting CO2! With apologies to ‘HotScot’, I believe the Tanaka-O’Neill paper is a confuséd mess. I would like to see the 2-degree target surpassed and hear the warmist explanations for why the world has become a more fecund and livable place. It doesn’t make sense as a scientific report because it is not a scientific report. It is political. What they are trying to do is spur action now while they still have some momentum left. Public interest is waning. Hence: “we got to act now, if we act later it will be too late.” to paraphrase all they are saying. Yeah, it’s the latest iteration of, “Soon it will be too late, but we can save the planet if we just ACT NOW.” More rushing to codify the BS into law so nobody can undo the (REAL) catastrophe even after the pseudo-science they have used as the excuse for the “agenda” was a bunch of nonsense. Meanwhile, the loudest blather comes from the nations whose emissions are rising, “Paris” be damned, and the nation who refuses to support the delusion is the only one with falling emissions. They can stick the Paris agreement and every other one like it where the sun doesn’t shine, it was just a money grab like the whole damn scheme. Well certainly looks to me they just adjusted their simplified model to give them the exact snswer they already ordained. In 20 years my CO2 emissions will be zero. Happy to do my part! Indeed. There will be more of the stuff left in the ground for future generations to benefit from. And while they do so, they’ll maybe ponder how it was that their ancestors were fooled into leaving it there. When one’s main fails, rather than admit to being wrong, one finds a convenient 2nd, or 3rd, … argument. It’s called lying to oneself. If leaving it in the ground means the children/grandchildren end up being poorer, then we have done them no favors. if we should ever solve the problem of controlled thermonuclear fusion, the hydrocarbons left in the ground will be practically worthless. With cheap energy of the electric kind, it will be possible to make designer molecules for things like plastics and lubricants without needing fossil hydrocarbons. Your remark is a bit like saying “Why did those of the neolithic period leave behind so much flint?” While good flint was highly prized by those living prior to the age of metallurgy, today it probably finds its greatest use in bolo-tie jewelry..
1.5C measured from When? This has been obfuscated a few times. This ‘science’ seems to require flexible targets, effects and add-ons to keep it running. After arguing against The Pause for a decade and a half, they modelled it and homogenized it and “discovered” it would have to exceed 17 yrs before the “theory” was compromised, which it was. So, on the eve of his retirement, Karl Karlized (one of my several contributions to the terminology) not only temperature but the whole Pause – it had become an intractable problem for the Team. The IPCCs position prior to all this was the CO2 problem began only after 1950. However, the length of the Pause was closing in on a tie with the duration of the alarming warming. Worse, most of the CO2 rise since 1950 occurred during The Pause! What to do? Well the trashing of Michael Mann’s hockey stick, and reinstating the LIA gave an out. 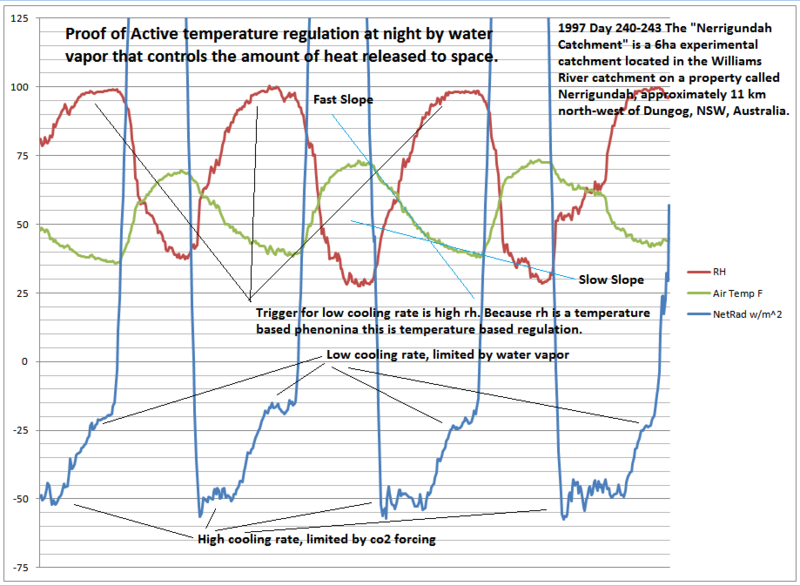 “Let’s let 1950s temperature ‘float’ at an ever changing uncertain level to be determined in the far distant future (recall Mark Steyn observation in the Senate hearing “How can one be so certain what the temp is in 2100 when we don’t even know what the temp will be in 1950!”), and let’s make use of the reinstated LIA. We’ll move the beginning of the CO2 problem back 100 years giving us a bigger temperature rise and reducing the effect of The Pause. Moreover, with Climate Sensitivity’ declining with each study, and forecast warming too hot by 200%, a much smaller CO2 warming is in the offing. What to do? ” I got It! instead of 3-5C of warming from 1950 being the end of the world, let’s make it, what, 2C from the end of the LIA for Armageddon. Heck, we’re halfway there”. This was in the middle of the Pause when it had been agreed to not notice it exists. With its embarrassing extension before Karlization, and after T observations stubbornly fell out the bottom of the projected envelope, 2C was beginning to look like an indigestable lump, so they bit the bullet and chopped another half a degree off the death by fire. This is all a left handed forecast that we can meet by doing nothing! Late to the party here, but I know what the frequency is, and it ain’t Kenneth. It’s Kevin, but I can understand, as he mostly goes by “Travesty Trenberth”. It is bizarre to me that knowing how the models have missed they wouldn’t have serious caveats in their statements. Given the lack of predictive ability of their models all statements as precise as we need to get emissions cut by 80% by this specific year and overshooting will produce this much temperature and we know the damage is so great that this will happen as a result so …. JUST WORTHLESS GARBAGE. EVERYONE MUST KNOW IT AND YET THEY STILL SAY IT.